Though not common, it's possible for a wrought-iron fence to suffer from enough rust damage that the rust eats its way through the iron. If you have a wrought-iron fence with rust damage, it can negatively affect the appearance of your yard. You do not have to replace the wrought iron to restore the luster to the fence; instead, you can patch the holes and repaint it. 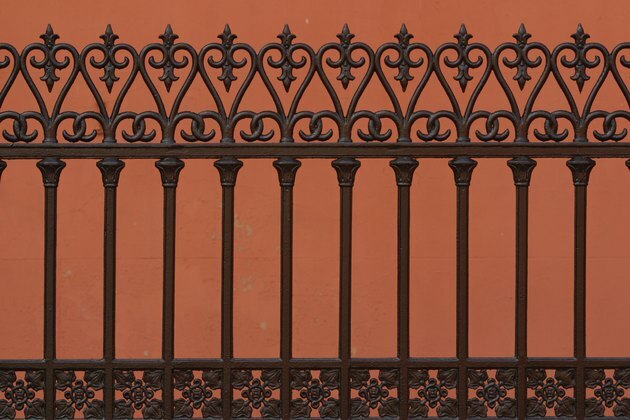 Putty can be used to fill holes caused by rust in your wrought-iron fence. Remove the excess buildup of rust with sandpaper, a sanding block or a rotary tool with a sanding disc. The process of removing the rust depends on its condition. If the rust is loose and flaky, you'll be able to remove it quickly and with ease. If it's more solid, using the rotary tool will make the job easier. Brush the holes in the fence with a stiff-bristled brush to remove any traces of rust. Fill the holes in the fence with putty by dipping a putty knife in the putty, forcing it into the holes and smoothing it out to give the repaired area a smooth finish. Allow the putty to dry for the length of time specified on the can. Sand the excess dried putty off the fence with 320-grit sandpaper. The goal of this step is to sand the putty until it's even with the wrought iron around it. When you run a finger over the repaired area, you shouldn't feel an indentation where you applied the putty. Paint the repaired area with paint that will match the rest of the fence. Wrought iron is typically finished in black, and you can apply the paint with a brush or use spray paint. If the rest of the fence has a faded appearance, paint it at the same time so that the entire fence is uniform.